GroupWise is a client-server, collaborative software platform to manage business email. GroupWise combines email, calendaring, personal information management, and document management into one application product. The server software runs on Windows Server, NetWare, and Linux, while the platforms supported by client software include Windows, Linux, and Mac OS X. While many organizations are still using GroupWise, others are planning to move to a comparatively secure and familiar working environment of MS Outlook. MS Outlook has an edge over GroupWise native client for many reasons. Outlook handles email archiving better than GroupWise. Personal Folders (PST) files are used to offload and archive data stored on the Exchange Server. You can access your mailbox and archive at the same time when using MS Outlook. Further, Outlook helps to cut down on the employee training cost, as the features are easy to use and configure. 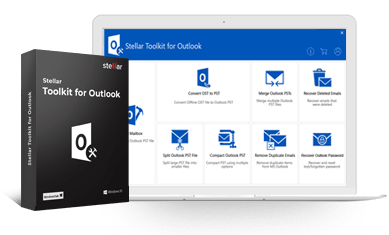 Stellar GroupWise to PST Converter provides a cost-effective and risk-free work around to migrate all data from GroupWise to MS Outlook. The software is user-friendly and allows exporting items of multiple GroupWise mailboxes to Outlook PST files. You can convert emails, address book contacts, calendars, notes, phone messages, document references and more. Run Stellar GroupWise to PST Converter. The main interface of the software appears along with the 'Connect to GroupWise Server' dialog box. In this dialog box, click 'Convert single GroupWise mailbox to PST file' for exporting a specific mailbox to Outlook PST. You also need to specify the name of the mailbox to be converted and the required password for login below 'GroupWise Server Information'. Click 'OK'. If you require converting multiple mailboxes at once, choose 'Convert all GroupWise mailboxes to PST files' option displayed on the 'Connect to GroupWise Server' dialog box. Provide the name of the GroupWise server administrator and the required password in the 'GroupWise Server Information' section. Click 'OK'. The software starts scanning the selected mailboxes and after the process is finished, you can preview them in the main interface as shown below. In case you are performing a batch conversion, you can preview the items of each individual mailbox. Select the items, folders, subfolders, or the entire mailboxes from the left pane and click 'Save' icon on the toolbar. In the 'Save File Option' dialog box, choose the preferred format 'PST', 'MSG', or 'EML' in single version (Or Office 365, RTF, PDF , PST, MSG, or, EML & HTML for Tech version) to save the converted mailboxes. Click 'OK'. When you convert a single GroupWise mailbox and choose 'PST' as the output format, you will see another dialog on your screen. You may choose to append the converted mailbox items to an existing PST or save them to a new PST at a desired location. After completion of the process, the following message box is displayed. Click the link on the message box to open the folder containing saved mailboxes. Stellar GroupWise to PST Converter performs a fast and risk-free mailbox migration for GroupWise GW-14, GW-12, 8.0, 7.0, 6.5, and 6.0. I wasn't expecting that migration is a simplified process with Novell GroupWise Server. But, this software had allowed me to export all user mailboxes into PST format. It really saved valuable time of admin like me.